The year-on-year growth of labor costs is becoming the norm in China, so it is particularly important for foreign companies to draw up a precise budget for labor costs before entering China. Labor costs not only directly affect the cash flow and profitability of enterprises operating in China, but also have an influence on their human resources management. The budget will vary from enterprise to enterprise depending on the industry, scale, nature etc. In addition, the entire process of budget calculation necessitates teamwork. This article seeks to provide a brief overview of the different labor costs rather than a comprehensive analysis thereof. An enterprise’s total labor cost comprises direct costs and indirect costs payable to the workforce that are incurred during the provision of products or services. Direct costs include total wages and social insurance contributions while indirect costs include staff recruitment, staff training, welfare costs, trade union funds and other expenses related to the workforce. 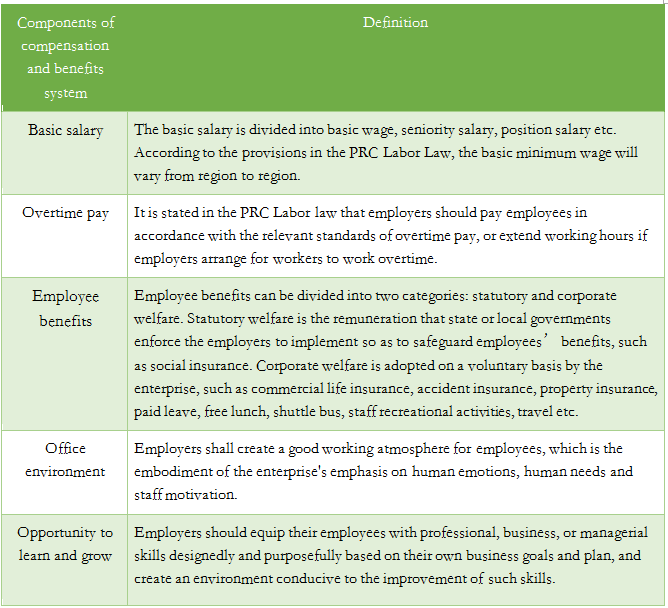 In Chinese law, the compensation and benefits system includes basic salary, overtime pay, employee benefits, office environment and opportunity for staff to learn and grow. 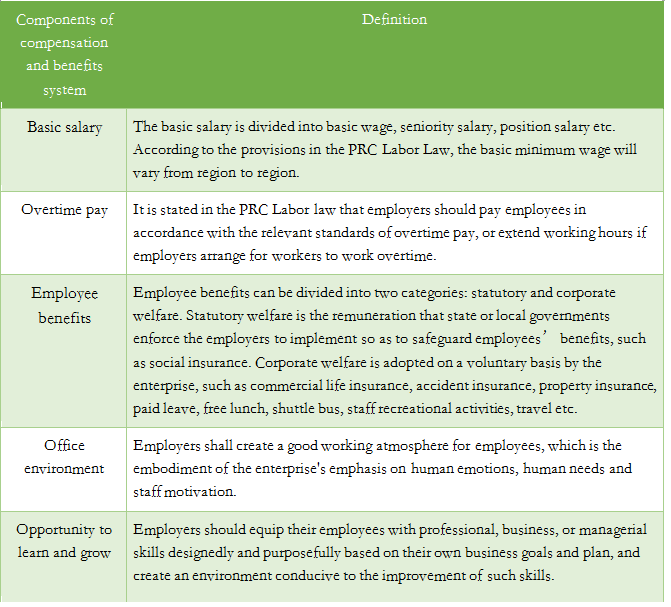 When calculating the total labor cost, enterprises need to take into account the social insurance contributions which they must pay for their employees under the law. At present, China’s social insurance can be divided into endowment insurance, maternity insurance, work injury insurance, medical insurance and unemployment insurance. The process of salary budgeting is the combination of top-down and bottom-up approaches. Consideration needs to be given to keep employee turnover rate within a reasonable range. Meanwhile, the enterprise should also maintain stable salary growth. In principle, the growth rate of labor costs per capita should be consistent with the growth rate of sales revenue per capita and the growth rate of enterprise value added per capita. Salary, social insurance contributions, etc. : salary for existing staff and expected salary for new staff; the expected salary is multiplied by the applicable premium rate to calculate the social insurance cost. Overtime pay, subsidies and bonuses: these have a positive correlation with the number of staff. Welfare costs: medical examination, festive allowances, etc. Recruitment costs: depends on the recruiting channel, e.g. the enlisting of high-end headhunting services. In Shenzhen, the amount of endowment insurance equals the payment base multiplied by the corporate payment ratio (14% for Shenzhen Hukou). 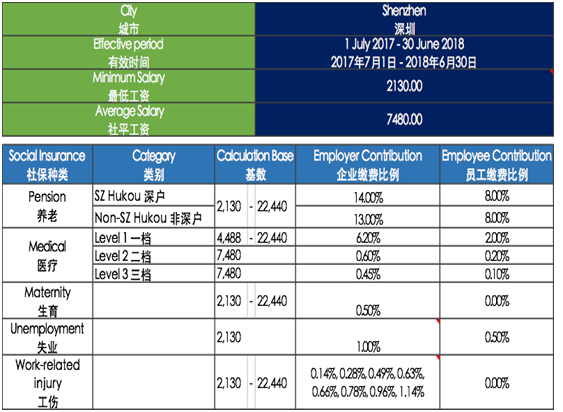 The payment base is the total wages of workers in the previous month, the maximum of which is three times the average salary of the society, while the minimum of which is the lowest wage standard for Shenzhen. This regulation is valid from July 1, 2017 to June 30, 2018. In Guangzhou, the amount of endowment insurance equals the payment base multiplied by the corporate payment ratio (14%). 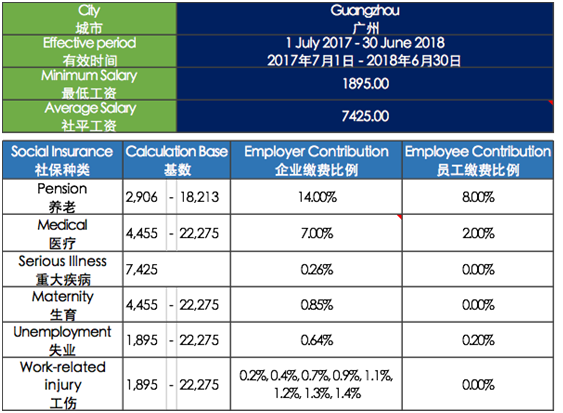 The payment base is the total wages of workers in the previous month, the maximum of which is RMB 18,213, while the minimum of which is RMB 2,906. This regulation is valid from July 1, 2017 to June 30, 2018. 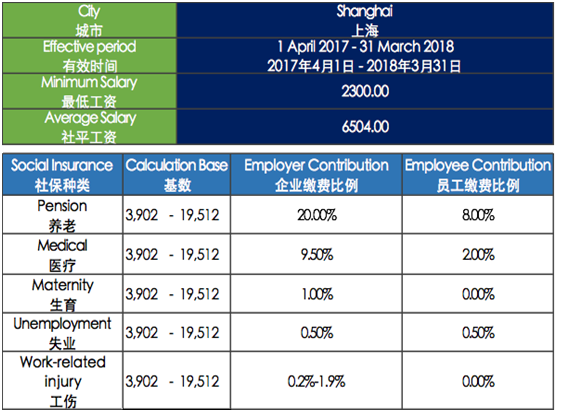 In Shanghai, the amount of endowment insurance equals the payment base multiplied by the corporate payment ratio (20%). The payment base is the total wages of workers in the previous month, the maximum of which is RMB19,512, while the minimum of which is RMB3,902. This regulation is valid from April 1, 2017 to March 31, 2018. The difference between the maximum and minimum social insurance payment base as well as the payment ratios in every region is evident. In addition, the payment base in each region is adjusted accordingly on a regular basis; it is based on the minimum salary, the average salary as well as the level of economic development of the region. Hence, it is recommended that the enterprise pay close attention to changes to the local social insurance payment base and make corresponding adjustments to the calculation of labor costs in a timely manner. To help foreign investors analyze the feasibility of investing in China, the Compensation Management Service Team at CW CPA keeps a close eye on the ever-evolving social insurance system and policy updates in China, providing foreign investors with a comprehensive analysis of salary levels and cost estimation before entering China. If you are interested in learning more about this service, please contact Delilah Li (delilah.li@cwhkcpa.com).